Communication is a core part of life. It always has been and always will be. In order for our kids to transition to healthy adults effective communication is critical. In the past five years there has been a noticeable regression in communication skills among teens. Serious back peddling going on. What is one of the main causes? Drum roll, please! The cell phone! We have young people unable to communicate in real, tangible ways because they are accustom to being behind a screen constantly. 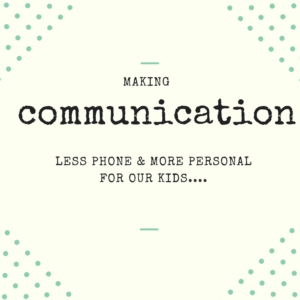 Teaching our kids how to communicate is super 9-1-1 level of importance. Here’s the deal, we have young people unable to make eye contact when engaging in conversation. When it comes to shifting from texting to phone conversations or engaging in conversation it evokes anxiety. Safety is found through their screen. This is scary and unhealthy. Human contact is something we need as human beings. Extract this and we’re in a scary place. Where there’s a will, there’s a way. Lay the foundation for your kids, because if we don’t it will present road blocks for them in the future. Previous generations were exposed to pay phones, passing notes and constant face to face interaction. Unfortunately, the progression of technology has some serious draw backs; this is one of them. There is a lack of personal connection. Engage in phone conversations with your child don’t rely solely on texting. Teach them HOW to engage in a conversation on the phone. We have a wave of kids who do not know how to have a conversation on the phone. There are heaps of kids who now become anxious when they have to engage in an actual phone call. Let’s extract that angst and replace it with comfort. Have them in charge of placing Friday night’s pizza order, scheduling their own dentist appointment or calling Grandma or Grandpa on a weekly basis (or bi-weekly). There is power in having them be comfortable with their own voice. It also strengthens confidence. Face to face time, not Face Time, but actual face time. Whether it’s asking what’s on the menu for dinner, what time is soccer practice or when are we going to Grandparent’s house; if family members are home the dialogue should be face to face. Avoid engaging in text conversation when everyone is home. This is prevalent and is impacting our kids communication ability and confidence. I’ve worked with kids unable to maintain a conversation without evoking acute anxiety. Typing has replaced person to person contact with so many teens and it is and will present obstacles for their personal and professional lives. We can both prevent and rewire this practice. Phone free is the way to be; at least during meal time. The best platform for learning and reinforcing communication is during meal time. Whether it be learning how to maintain eye contact or the ability to listen and, in turn, ask questions. The dinner table has unlimited teachable moments. It’s easy to underutilize its power. Teens do want to communicate, even when they don’t realize it. If we give them opportunities to be distracted then they’re going to be distracted. The ability to have person to person contact is a connection each of us need as human beings. When it does not exist it presents issues with self image, confidence and the propensity to evoke anxiety and depression. People need people. This issue concerns me. Over the past two or three years the increase with kids commenting on how uncomfortable they are on the phone or chatting one on one with a teacher, boss, parent, etc. has increased. This directly correlates with more screen time and less people time. It’s time to reclaim the true personal connection in dialogue with other human beings. We can make this happen, but just like anything it must be consistent and have follow through. It isn’t just throwing down the law, it’s dialogue. Why are we doing this? Where did this come from? Let your kids in the know so it isn’t perceived as a punishment, because it isn’t. It’s a gift that they will get much later on in life. Parenting is roller coaster crazy awesomeness. We aren’t friends, we’re the architects of their character. Know that with stronger and more personal forms of communication comes a stronger relationship with your teen. Rock on! Wishing you a week of ‘I can see your eyes,’ communication:) Peace, Love & Goodness!